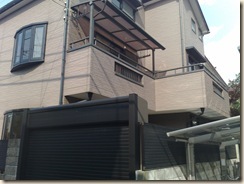 The second part of today’s trip was to walk from Kichijoji to the new house in Suginami city. The term “city” is a bit misleading as the Japanese slap this epithet on any former township that has long-since been absorbed into the sprawling metropolis of Tokyo. But I digress. 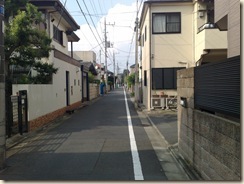 The new gaff is about a 20 minute walk from Kichijoji which is not too difficult, even in today’s oppressive heat and humidity. By the way, I should point out this it has been f***ing hot today – 34 degrees and god-knows what humidity. Let’s just say that inside an air-conditioned department store, the humidity was 55% according to the readouts on the barometers they were selling. Anyway – I digress again. 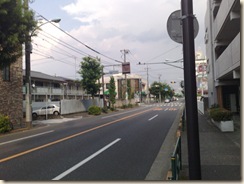 Here we are at the outskirts of Suginami city. There is such a curious mix of shops and buildings along the road that it’s hard to get an impression of what the people living there are like. Boxing gyms nestle alongside “antique” shops, Mercedes dealers and kitchen hardware suppliers. Come to think of it, it sounds a bit like Peckham. But a more genteel version, I’m sure. Eventually, we came to the new house, tucked away on a side street, not more than a stone’s throw to the local convenience store – or my “beer fridge” as big M calls it. First impressions are that it seems in good order and quite a comfortable size. The road itself seems very quiet with little through traffic, so I’m sure it’s going to be quite a quiet place to live. That’s our front wall on the right. There seems to be a lot of dog owners in this area – not sure how the cat will feel about that, but there’s enough greenery around for him to feel at home I think. I get the impression that the neighbours are older people. Whether that’s a good thing or not remains to be seen. Next Post It’s alright – I’ve found the pub!